Singapore's Research, Innovation & Enterprise (RIE) 2015 Plan targets to develop the nation into one of the world's leading research-intensive, innovative and entrepreneurial economies. The Singapore Government will invest $16.1 billion over 2011–15 as part of its RIE$ 2015 plan. This is 20 per cent increase over 2006–10 and demonstrates Singapore's continued commitment to both basic and mission-oriented research for public sector institutions. The city-state is reviewing its science and technology programmes and policies ahead of the 2015 tranche of science funding, which could be up to $20 billion. In 2012 gross expenditure on R&D (GERD) was $7.2 billion, or 2.1 per cent of GDP. This is on par with the GERD figures of small advanced nations such as Israel and Sweden. Notwithstanding the government's deep commitment to research, innovation and enterprise, Singapore's S&T policy is still highly dependent on foreign inputs. While the government can pump in money to sustain research conducted at the various A*Star institutes and universities, the reality is that it is a huge challenge for the small island nation to achieve scientific and technological selfreliance, as managed by small countries like Israel, Japan, Taiwan and South Korea. Moreover, the transfer and diffusion of scientific and technological knowledge and skills owned by the foreign experts to local Singaporeans is never guaranteed. There is also no critical mass of Singapore-born scientists and research engineers. The number of Singaporeans and permanent resident RSEs actually declined by 1.5 per cent from 21,702 in 2011 to 21,380 in 2012. On the other hand, the number of foreign RSEs grew by 12.2 per cent during the same period. Although the problem can be somewhat alleviated by the “foreign talents” who eventually decide to become Singapore citizens, this pathway could add to the already contentious issue of the government giving away jobs to foreign nationals. Particularly in the biomedical sector, the limited number of Singaporean scientists is also compounded by the problem of Singaporeans generally not being keen to pursue higher degrees and to undertake R&D activities. To top it off, the returns on investment in biomedical R&D is unpredictable. In short, Singapore's aggressive foray into biomedical research could, at best, achieve its aim of luring the big names in pharmaceutical manufacturing to set up shop in Singapore and, in the process, contribute to the national wealth. In recent years the small island city-state of Singapore has gained the world's attention for its aggressive policies in enticing the international scientific community and corporate entities to relocate and contribute to its agenda of building a world-class research and development (R&D) hub. The Singapore Government has also been making concerted efforts to encourage young Singaporeans to think “science and technology”, to motivate science and engineering graduates to pursue their interests in the field of R&D, and to propagate the rise of a critical mass of technopreneurs. At the national policy level, Singapore's science and technology (S&T) policy has shifted from the traditional wholesale adoption of Western technology of the 1970s and 1980s to a policy that aims to promote indigenous technology development through an integral dynamic innovation-systems perspective for stimulating innovation. Singapore is ploughing 2.3 per cent of its gross domestic product (GDP) into R&D, which brings it closer to other countries famed for their focus on research, such as Denmark and Switzerland. Singapore targets to raise R&D spending to 3.5 per cent of GDP by 2015, which would place the small citystate among the top five research-intensive countries, including Israel, Sweden and Japan. Singapore's determined move to integrate science and technology into its overall economic strategic plan has been largely influenced by many changes. The desire to close the technological gap also reflects the prevalent ideology to survive and to catch up in view of the dynamic changes in economic relations between countries, in which technology has become a dominant competitive force. Singapore's economic growth now centres on an innovation-driven, industrial strategy. Innovation is more than simply new technologies; it involves how business processes are integrated and managed, how services are delivered, how public policies are formulated, how markets are developed and, more broadly, how the society could benefit from creativity and innovation. It is also the case that in a global, knowledge-driven economy, technological innovation — defined as the transformation of new knowledge into products, processes and services of value to society — is critical to competitiveness, longterm productivity growth and an improved quality of life. Among the major factors determining the city-state's global competitive position, a well-planned science and technology policy and technology infrastructure can be considered as important pillars. [P]ure or basic research to enlarge the frontiers of knowledge without conscious applicable goals is not wasteful. Seemingly esoteric research has led to very practical applications affecting our daily life, but a developing nation like Singapore has neither the financial nor human resources to indulge in it. Our efforts have to be primarily in that area of research more properly termed development, which works on bringing out new or modified products and processes based on established findings and technology…. Such an approach is precisely one reason for Japan's success. It is true that the Japanese had been very successful in the practical application of new technology. But one has to note that Western science and technology had taken root in Japan since the seventeenth century. Rangaku, or “Dutch Learning”, was already making inroads into Japan during the sakoku period (1641–1853), during which the country was closed to foreigners. As the Dutch trading post at Dejima was effectively an enclave of the Netherlands, for 212 years it was just about Japan's only way to keep tabs on European scientific progress. Rangaku has influenced Japanese medicine, anatomy, engineering, meteorology and chemistry, among other fields. Western science continued to be assimilated during the Meiji era (1868–1912) and the imperial government actively promoted the learning of scientific principles and application right up to the end of the Pacific War in 1945. During the 1970s and 1980s, perceptions concerning technological advancement changed substantially as a result of the phenomenal post-war rise of Japan, followed by the four Asian NIEs — Hong Kong, Taiwan, Singapore and South Korea. Particularly for South Korea and Taiwan, they have experienced economic growth through their ability not only to manage effectively foreign technology but to also develop a dynamic indigenous base. Hence, for the Asian NIEs, science and technology have become critical catalysts for economic development. Increasingly, attempts to explain the success of rapidly growing economies have involved a technological dimension. In this work, the broad theoretical framework of the relationship between technological change and economic development is seen from two shifting paradigms — from the dependency theory and technological dependence to the theoretical concepts of catching-up and technological leapfrogging and how they are achieved through the role of the state and society. The dependency theory, simply stated, maintains that growth and development in the developing countries (“the periphery”) is hampered by structural dependence on the advanced, industrialized countries (“the core”), although the degree of such constraints varies widely. The theory was made popular during the 1970s by the pessimistic views of Gunder Franck and Samir Amin, both of whom asserted the impossibility of peripheral development in the so-called Third World because of the ways in which the industrialized countries exploited the resources of the former. In a later work and in response to the emergence of the newly industrializing countries, Frank argues that the popular strategy of export-led growth by these countries did not create genuine development because it was also largely dependent on the flow of international capitalism and foreign technology. Writing in the early 1990s and when the world economy was becoming more competitive, more global and increasingly controlled by information and communication technology, Brazilian political economist Fernando Cardoso reaffirms the dependency position of many poor and developing countries. But now they faced “a crueler phenomenon: either the South (or a portion of it) enters the democratic-technological-scientific race, invests heavily in research and development (R'D), and endures the information economy metamorphosis, or it becomes unimportant, unexploited and unexploitable”. Today, more than ever, the state of a country's science and technology is a critical factor for economic competitiveness and long-term growth. This book traces the development of science and technology policies and initiatives in Singapore since 1965. Developed as a trading entrepôt by the British, science and technology were never strongly emphasized, right up to the 1970s. However, the need to stay ahead of economic competitiveness motivated the Singapore Government to initiate its national science and technology policy from the 1980s – moving Singapore from a low-skilled, low-technology economy to a high-skilled, high-technology one. Today, the drive for Singapore to become a hotbed for technological start-ups and R&D activities, supported by strong government funding and cutting-edge facilities, seems promising. Are the aspirations of nurturing a Silicon Valley–type culture in Singapore achievable? Are pragmatic, risk-averse Singaporeans ready for the mindset change? 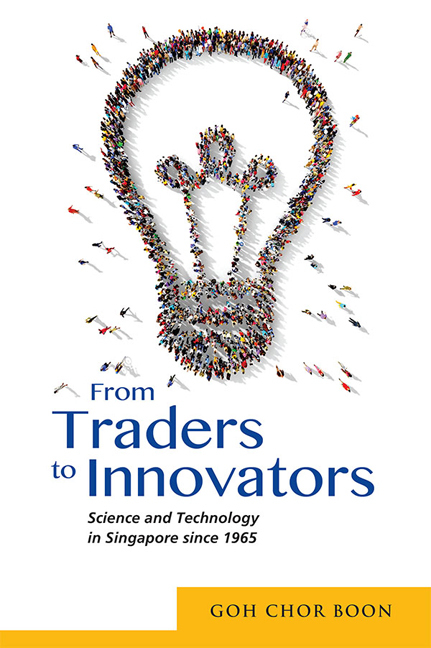 Can a nation of traders and service-brokers become a nation of technological innovators and entrepreneurs? This book attempts to provide the answers. One key aspect to the development of Singapore's industrialization in the 1960s and 1970s was the recognition by the Singapore Government of the importance of science and technology in economic development. However, its liberal economic philosophy of attracting a mainly product-assembly type of foreign enterprise was a mismatch for meeting the objective of raising the level of technological competence of the workforce. By the end of the 1970s, realizing that low-technology and low-skill types of industries would not maintain a strong competitive edge over her neighbours, Singapore moved into the 1980s with the introduction of a new industrial policy package aimed at shifting the economy into a “Second Industrial Revolution”. As a key component of Singapore's industrialization and with the aim of enhancing the country's economic competitiveness, a technological trajectory plan was developed during the 1980s. This was the first official blue print of the government's strategy to tap on science and technology. But the central role of MNCs in spearheading the country's progress in techno-industrial innovations reinforces technological dependency on external sources and, because of the “pro-MNCs” industrial policy, indigenous firms, as in the 1970s, were left behind. The overall impact of Singapore's industrialization during this period was to stifle the growth of a technological culture and, hence, slowed the drive towards deepening the indigenous technological base. Singapore achieved “fame” as the most competitive NIE in the Far East, but in reality achieved few “gains” in terms of developing its indigenous technological capability or self-reliance. The government's haste in leapfrogging towards achieving an advanced industrial status for the country created contradictions that could narrow rather than widen the road to this end. The 1980s saw the implementation of an aggressive development strategy, probably not undertaken by any other developing country — and the Singapore Government designated it as the “Second Industrial Revolution”. Presumably, Singapore had its “first” industrial revolution during the 1970s when the industrial policy of transforming the economy from a labour-intensive to a capital-intensive one was launched. Did Singapore actually experience an “industrial revolution”? Interestingly, the literature on the Singapore economy has so far failed to address this issue. Perhaps it was just a title with no significant implications. But the use of the term “industrial revolution” in the context of an economic history generally denotes a sustained and accelerated growth of indigenous technological innovation and scientific inquiry. The impressive economic performance of the East Asian economies since the 1970s has gained not only the attention of economists but increasingly social scientists as well. While not rejecting altogether economic explanations, this latter group of scholars had attempted to link the macroeconomic dynamism with cultural factors inherent in the societal systems of these countries. Though it would be unwise to attribute the so-called “East Asia miracle” solely to the predominance of positive cultural traits, they could, as postulated by Peter Berger, very well serve as a “comparative advantage” in the process of capitalist development. The nature of technological creativity and innovation is affected by a society's culture and social structure. The specific motives and actions of parties involved with technological change do not crystallize or unfold in a vacuum. Instead, they do so within a background cultural context. The term “culture” here is broadly defined, in the words of Alex Inkeles, as “the grand total of all the objects, ideas, knowledge, institutions, the ways of doing things, habits, behaviour patterns, values and attitudes which each generation in a society receives and passes on — often in altered form — to its successor”. These cultural factors interact and influence each other to produce the “cultural system”. It is imperative that any account of a country's scientific and technological development be seen against the elements of its overall sociocultural-environmental system. Culture has a profound impact on the innovative capacity of a society. Innovation is a creative process, and the nature of creativity and innovation by which technological progress takes place is affected by the culture and social structure within which that change is occurring. The direction that technological change takes and the ways in which a culture puts scientific and technical knowledge to innovative use are dependent upon the belief systems of the culture, the opportunity and the ability to technologize, the motivation to do so, and the freedom to question and change, if necessary, the established characteristics of the culture. Without these technological imperatives, innovation does not take place. Several studies, especially the Hofstede Indices or IBM Survey, have shown that the cultural system of a society may either foster or inhibit scientific and technological development. In 1982, Masanori Moritani of Nomura Research Institute gave a frank assessment of Singapore's ability to develop its own industrial and technological innovations. Based on Japan's successful experience with industrial and technological development, Moritani identified seven cultural traits essential for sustaining high-technology growth. They are diligence, expertise, application ability, quickness and resourcefulness, elaborateness and cleanliness, refinement, and organizing ability. While not doubting that Singaporeans possess the qualities of diligence and quickness and resourcefulness, Moritani had reservations on the remaining five traits, especially the need to develop expertise and organizing ability. Japanese engineers and line workers alike recognized the need to accumulate a high level of knowledge of technology within an enterprise, and thus become “well-informed experts who know in the greatest detail the process of work”. This cannot be said of the workers of Singapore because “many people who after working on a job for one or two years, feel that they have mastered the job and want to move on to another job”. Moritani himself downplayed the perception that Japan is a country of groupism, which implies concerted action at the orders of a leader who has absolute power. He clarified that, within a group, each member expresses his view frankly and the leader mediates different opinions and forms a consensus. Thus, the traits of self-restraint and the need to conform do not imply passiveness or meekness. On the contrary, they called for the ability to give constructive and creative suggestions and, at the same time, the ability to tolerate individualism and be ready to compromise to the group's final decision. According to Moritani, this harmonization between the whole and individuals, both at the group and organizational levels, is essential for rapid technological development. Perhaps responding to his observation, the Japanese concept of QCCs was introduced by the government into Singapore's industrial scene in an attempt to stimulate ideas through teamwork. In 1982 about 2,000 QCCs were formed, and by 1988 about 56,000 of them had been introduced. Between 1980 and 1989 there were 703 articles and reports on the QCCs in the Straits Times. Particularly in the 1970s and 1980s, Singapore took great pains in learning from her one-time colonial master how to achieve industrial success. The 1950s and 1960s were turbulent decades in Singapore's history. They highlighted the vulnerability of the state and the economy, which was highly dependent on external developments, both regional and worldwide. When Singapore became a sovereign state in August 1965, her leaders were faced with the unenviable task of ensuring the political and economic survival of the small city-state. Colonialism had produced a lopsided economy strongly dependent on entrepôt trade. But the world was changing fast. Increasingly, science and technology became the vital ingredients that would dictate a country's level of competitiveness. Hence, the overriding priority of the Singapore Government in 1965 was to find the quickest and most effective way to develop an industrialized economy. However, it is argued here that historical forces continued to dictate the nature of Singapore's industrialization programme. Moreover, Singapore's industrial strategies adopted during this period had little impact on the growth of the indigenous technological capability of the country. On 15 February 1942, the British Commander General E. Percival surrendered the “impregnable fortress” of Singapore to the Japanese. The fall of Singapore “meant not just the end of a campaign; it meant the end of an age”. Singapore was renamed “Syonan-to”, or “Light of the South”, and, together with Malaya, became a part of Japan's Greater East Asia Co-Prosperity Sphere. However, like the British, the Japanese recognized its exceptional geographical advantages, and Singapore became the administrative centre of the Japanese Empire in Southeast Asia. The economy of Singapore was shattered during the period of Japanese rule. Its infrastructure was badly damaged when the British, while retreating from Malaya, destroyed bridges, machinery and motor workshops, oil depots, railway lines, and other public installations. The island's entrepôt trade and Malaya's export of raw materials such as tin and rubber were severely disrupted as Japanese rule cut off the main European markets. Japanese zaibatsu took over most of the economic assets of the British, American and Dutch. The local Chinese, too, lost most of their business concerns. Those suspected of loyalty to the Chungking government in China had their properties confiscated. In short, the Japanese conquest of Singapore exposed the structural weaknesses of the economy — the dependence on entrepôt trade and the virtual absence of an industrial sector. As the world economy develops, markets and nations alike have become more global and competitive. Technology has become a dominant competitive force. Unlike the older form of mass production technologies, by the late 1990s the emphasis had shifted to such strategies as productivity, quality, speed in getting new custom or semi-custom products to the market and after-sale technical services. These changes have created tremendous pressures on nations to respond quickly. Equally important, the vastness of these changes have exposed weaknesses and imbalances in the socio-economic structures of nations, such as inadequacies in education systems, poor government–industry–university linkages, the inappropriateness of R&D policies, inefficiencies of the technology infrastructure, and the incompatibility of existing sociocultural orientations towards technological change. These trends and their repercussions not only affect nations like the United States and Japan, they also exert demands on latecomers like Singapore. How has the small, trading city-state fared? This chapter examines the attempts made by the Singapore Government to establish a scientific and technological environment since 1980 and analyses the policies and problems associated with this development. The discussion is seen against the context of changing global scenarios. Undoubtedly, in terms of per capita GDP growth during the 1980s, East Asian countries were well ahead of the developed countries, with the former achieving a growth rate of 9.3 per cent in 1988 and the latter achieving 3.5 per cent. As the major economic power in Asia, Japan's success also produced what has been called the “flying geese” pattern, with the implication that ASEAN countries (except Singapore) and China are catching up with the East Asian NIEs, or the “little dragons”, in labour-intensive, low-technology industries, while the East Asian NIEs are, in turn, catching up with Japan in high-technology and knowledge-intensive industries. By the early 1990s the East Asian NIEs — South Korea, Taiwan, Hong Kong and Singapore — had graduated as major exporters of more mature consumer products in microelectronics, computers and telecommunications equipment, and this trend created a new dimension to the relationship between East Asian NIEs and the developing countries, particularly those in Southeast Asia.